This little angel is in flight carrying a green wreath with red berries. She is wearing a coral gown with blue trim and a blue belt with streamers. She has white wings, and brown hair. 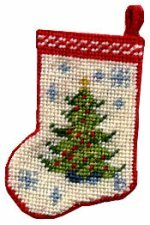 The top border of the stocking is outlined with green and has flowers and leaves within. The toe is accented with three flowers. The background is off-white. A charming stocking for any female member of your wee household. This simple but attractive little Christmas tree, crowned with a gold star, is worked in three shades of green and has red ornaments. It appears on an off-white background with blue snowflakes. The top border is red and white. Any family member would be proud to hang this on Christmas Eve! This moose is all decked out for the holiday. He is sporting a big fluffy wreath of greens around his neck trimmed with a large red bow. As he is showing off his new attire to friend Bunny, a red bird arrives with an offering for moose's new collar. Who wouldn't want to hang up this stocking on Christmas Eve? Presents from Santa! A fine yellow doll house, a brown rocking horse, a drum with drumsticks and an alphabet block (just one from an entire set, no doubt) are all waiting for Christmas morning beneath the decorated branches of the tree. A lovely rendition of Father Christmas very suitable for the masculine members of your wee family. The colours are primarily reds, blues and golds on an off-white background. 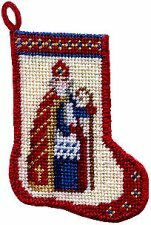 This festive stocking is a bit different with a 3D cuff and tassel. It coordinates with my Table Runner pattern in the December 2004 issue of Dollhouse Miniatures magazine. Someone in the Mouse household is going to receive some very special gifts and Mom wants to make sure that the bow is just right. The mantle in the background is decked with a garland, a candle in its holder and a stocking. Shhhhh, don't wake the children!